This is absolutely mindshattering, and doesn't get the attention it deserves. 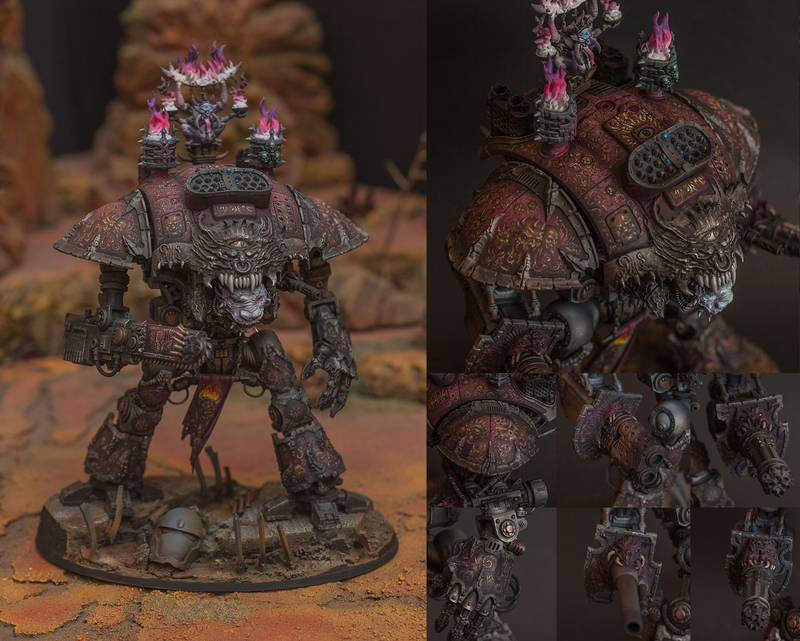 The matte toned down colors, the absolutely amazing freehand and overall work on the modell is just out of this world. It is very far from the eyebleeding contrasty and airbrushed-to-death minis, and this is a good thing. I regularly browse, but never registered, this mini made me do it. Everything is almost on point, the metal feels like metal, the freehand doesn't look forced, the braziers on top don't look out of place. The only little tiny bit of problem I am having is that maybe the purple tones are a little too dominant, but it is just nitpicking. Absolutely amazing and well done work. At first glance it looked like a nicely painted mini. Was going to give a 7 but then I looked closer and saw all that wonderful freehand. Very well done and has a real World Bearers feel to it.